We had a chance to spend an hour or so recently with Eric Gensel, Olympus technical specialist, going over the new M1 Mark II. He was keen to point out not so much the specifications announced earlier today but what they mean to a photographer. M1 Mark II. With the 12-100mm f4 mounted. So he brought along the company's three new lenses: the 30mm macro, the 25mm f1.2 and the 12-100mm f4 announced at Photokina. He also had the STF-8 macro flash and the new E-PL8 with him. You could throw all this in a small bag, he pointed out, and with the M1 Mark II's image stabilization even skip the tripod. And you'd be ready for just about anything, whether high resolution stills or handheld 4K movies. The only thing he didn't toss in that bag was the price, which was announced today. Two thousand clams. And we really should have seen it coming. Not only is the camera itself nicely engineered and the prototype we handled quite solid but the company has a four-year succession plan you should know about. Put simply, they plan to introduce a new flagship every four years. So that comes down to an investment of $500 a year. You might worry that four years is a long time in technology and the camera will, after two years, say (which would be the next Photokina) fail to measure up to the competition. But Olympus has a plan for that too. Gensel said it was free firmware updates, something the company is already doing. M1 Mark II. The view from the rear panel. Assuming the hardware is up to the task, a new firmware update will add new capabilities for four years, minimum. You just have to be brave enough to perform the updates. If you aren't, Gensel said, any Olympus dealer will do them for you. We found the four-year plan reassuring, as if we would not be obsolesced in a year or two. A commitment, it seemed, to the buyer. Gensel went over a few of the more obscure features of the new model. We looked for them as we went through the specs, but they weren't in the list. The electronic shutter is on the list but it is too easily overlooked. You're getting phenomenal continuous shooting bursts as well as ridiculously fast flash sync with it. We've asked for clarification but it may also be behind the improvement in the rolling shutter problem. A mechanical shutter moving down the film plane bends verticals (they aren't in the same place at the end of the exposure as they were at the beginning). An electronic shutter, which is something like a screen shot, wouldn't. Gensel demonstrated autofocus tracking at 18 frames per second with a few stills of a bird of prey flying toward the camera. One set was taken by a recent high-end Canon dSLR and the other by the M1 Mark II. And, as you might expect, the M1 Mark II kept that bird in sharp focus all the way in. What it doesn't tell you is that the camera's eight processors is predicting and reviewing focus at those points. They also tap into the data from the camera's gyro to inform predictive accuracy. The high-end of ISO sensitivity is 6400, Gensel pointed out, but that isn't the whole story. The M1 Mark II applies color noise reduction filtration on the sensor data before it is written to a Raw or JPEG file. He showed a couple of examples, most notably, the blue-channel noise removal of an underwater shot. We asked if this had any effect on the dynamic range of the image but he didn't know. And, no, it isn't something you can elect to skip. Gensel showed off the five-axis image stabilization with some handheld night shots. The shutter speed? Two seconds. Or you can look at it as a 5.5 stop compensation. So all those slow lenses (f3.5 and up) turn out to be fast enough to avoid camera blur. But that's not quite the whole story. Unlike what we have been told in the past, you can couple the M1 Mark II's body-based stabilization with lens-based stabilization for M.Zuiko Pro lenses. And that gets you a 6.5 stop increase. It isn't a simple matter of mechanics, either. The lens and body talk to each other, discussing what kind of movement they are experiencing and how best to handle it. The lens, with two-axis stabilization, informs the body, with five-axis stabilization, what it can do. Gensel pointed out that the glass itself has some obscure features worth nothing, including: vapor crystal coating on internal elements. Capture C4K (4096x2160) video up to max bit rate of 237 Mbps at a 24P frame rate for true cinema quality. For even greater flexibility, shoot 4K (3840x2160) video with a 30P, 25P or 24P frame rate. With the E-M1 Mark II's 5-Axis Image Stabilization and electronic stabilization that's optimized for video, you'll shoot ultra-smooth handheld UHD video without tripods, jibs or other bulky stabilizing equipment. Plus, there are two HDMI output modes: Monitor Mode supports an external monitor display, while Recording Mode records to an external monitor recorder. So there's support for third-party monitor and even third-party storage solutions. But you can go gonzo, too. Which should be a boon to reporters traveling in the darker corners of the world. The issue with any EVF is how you handle burst shooting. How do you follow the action in the viewfinder? Do you blackout the EVF during the burst or show (briefly) captured data (which is, by definition, out of sync). Olympus decided to go with a blackout rather than the inaccurate older data. It can get data from the sensor to the EVF in 5 milliseconds. Pro Capture uses the silent electronic shutter to start buffering a running series of full resolution JPEG/Raw images when you press the shutter release button halfway. Then, fully press the shutter release to capture an image plus the 14 previous frames all at once. You can keep the shutter release fully depressed to continue sequential shooting. It's pre-capture by any other name, something we always wish we had whenever we get it into our skull to do bird photography. You can get up to 77 images in the buffer for each shot, Gensel said. Olympus has made the M1 Mark II a lot more flexible, responding to the pleas of photographers everywhere. One simple example Gensel pointed out was the Power button. Some people want it on the right, near the Shutter, for one-handed operation while others prefer it on the left. A menu option allows you to switch control from the labeled Power button on the left to the F button on the right. You can also control what is written to each of the dual card slots via the menu system. You can write the same data to both cards as a built-in backup, write Raw to one and JPEG to another or any number of combinations. And this time around, Olympus has jettisoned the propriety data cable in favor of a USB3 cable. After the presentation we did get to shoot around with the M1 Mark II but we were not allowed to record any images (we did record images on our E-PL1 with two of the new lenses and we'll talk about them shortly). So we got a feel for the M1 Mark II. We very much liked that feel, too. The electronic shutter was something of a shock but the thin grip was comfortable and, like any Micro Four Thirds camera, it was light and easy to maneuver. We also didn't notice the delay we're accustomed to using an EVF. All big pluses. The menu system didn't seem particularly friendly, but it isn't fair to judge on such little acquaintance. Gensel took a moment to find the Power button switch option for us. Options are listed alphabetically so you have to know their name to find them. Two things were clear from our afternoon with Gensel and the M1 Mark II. 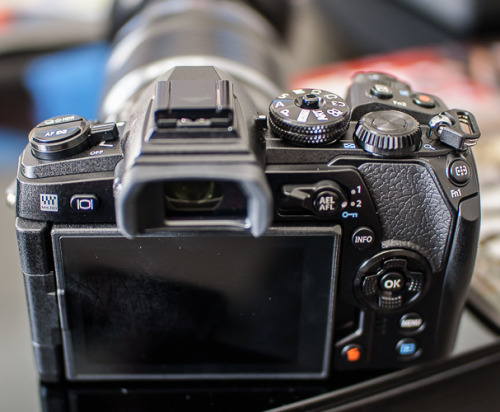 First, the advantages of the Micro Four Thirds format are compelling when matched to a pro-level body. We can't tell what our dSLRs can do that the M1 Mark II can't. Second, Olympus has built out an ecosystem for the M1 Mark II that includes not just interesting optics but wireless and macro flash plus remote control. Again, we can't compare that ecosystem to those of say Canon, Nikon and Pentax. 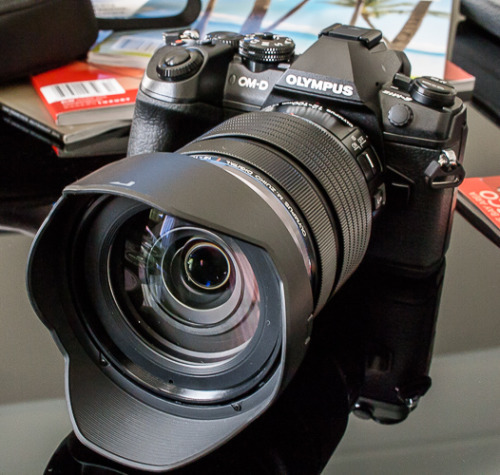 But if you're in the market, include Olympus in the discussion.